The Community Transformation Café discussion continues with a dynamic panel and workshop event examining different aspects of leadership for social innovation. We invite practitioners, students, enthusiasts and curious minds to join us in exploring the skills required in the nonprofit sector today. Social Innovation Leadership in Practice: What are the methods that are changing the way we organize for social change? Deeper Dive Workshop, 1:45-3:30 P.M.
A focus on complexity theories, and how we are using increased connectivity to open new possibilities for civic organizing; real life projects are welcome. 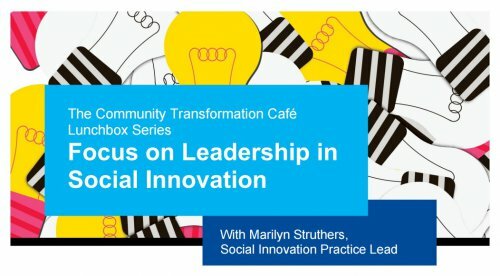 RSVP socialinnovation.fcs.ryerson.ca/lunchbox2016/ Light lunch and refreshments will be provided. Please connect with us by e-mail at tracy.francis at ryerson.ca or phone at 416.979.5000 extension 6128 if you require accessibility accommodations.